Most often used as a flavoring and stability agent in beer, hops have become more popular during the past few years, due in large part to the boom in the craft brewing industry. Patrick Byers (right) and Jim Quinn, both University of Missouri Extension horticulturists, planted … Expand ▸Patrick Byers (right) and Jim Quinn, both University of Missouri Extension horticulturists, planted hops for the first time in their respective careers in 2017. The hop yard is located at the Bradford Research Center and includes 10 varieties. 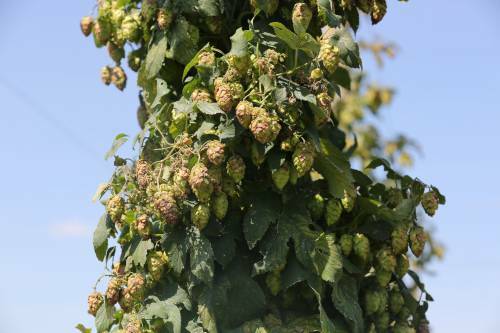 Hops, which are cone-shaped flowers, aren’t a new crop for Missouri, but it’s been years since hops have been an agricultural mainstay in the state. Byers and Jim Quinn, both University of Missouri Extension horticulturists, planted hops for the first time in their respective careers in 2017. The hop yard is located at the Bradford Research Center and includes 10 varieties. 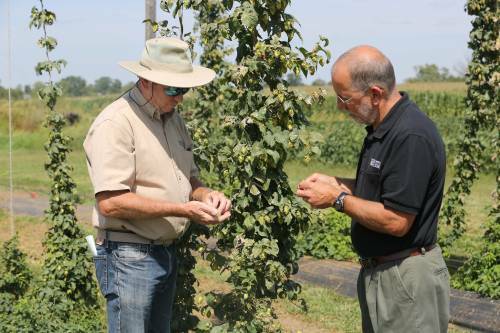 Byers and Quinn have attended numerous meetings about growing hops and learned about similar efforts in Michigan, Ohio, North Carolina and New York. 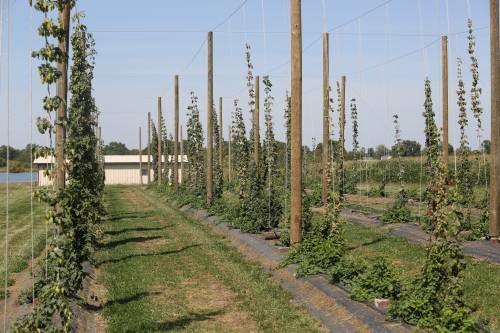 Byers and Quinn competed and secured funds from the Missouri Department of Agriculture to establish its hop yard. The duo planted the hops in late April of 2017 and saw immediate results. “These things just jumped out of the ground and grew,” Byers said. Hops, which are cone-shaped flowers, aren’t a new crop for Missouri, but it’s been years since … Expand ▸Hops, which are cone-shaped flowers, aren’t a new crop for Missouri, but it’s been years since hops have been an agricultural mainstay in the state. Byers and Quinn hand-harvested the hops in July and August. Harvest happens by snapping the vines and pulling them down from the twine. Byers and Quinn bring the vines in and pick the cones off the vines by hand. Byers said that hops growers generally use a machine that strips the cones off the vine. Even though there was extra work in terms of harvest at Bradford, the results from that harvest was surprising to both Byers and Quinn. “Based on what we saw, it might be worth it to go after a yield in that first year,” Byers added. “If you can get your plants in early enough, it could definitely be worth it. Hops grow on a vine, generally up a piece of twine or string. Climbing up a piece of twine gives the hops better air circulation and reduced disease pressure. The Bradford hop yard is divided into two sections. The first section contains 200 plants, which are commonly grown in the Midwest. The second section has a collection of various hops varieties. The Bradford hop yard is divided into two sections. The first section contains 200 plants, which are … Expand ▸The Bradford hop yard is divided into two sections. The first section contains 200 plants, which are commonly grown in the Midwest. The second section has a collection of various hops varieties. As part of the grant, Byers and Quinn also set up several field days that engaged the local community with the process of establishing a hop yard, planting, harvesting and promoting their product. The duo have laid their entire workflow out during these field days. Quinn said that Columbus, Galena and Chinook are among the varieties that are growing the best. They are currently running quality analysis – and still learning about harvest timing and drying. There are some challenges with growing hops in Missouri. Disease and insects are both on the list. “We don’t have a lot of the infrastructure in Missouri to support large acreage, but there is potential,” Quinn said. “There are definitely virus issues and fungal diseases, such as downy mildew and powdery mildew. Mites, leafhoppers and Japanese beetles can also cause problems.